Women are in love with Balayage highlight hairstyles as it gives them the opportunity to showcase their long hair. Consequently, there are numerous hairstyles to choose from. This guarantees uniqueness on the hairstyle you choose. Women are encouraged to choose Balayage highlights hairstyles because there is something for everyone. Below are some top notch Balayage highlight hairstyles worth checking out. This marvelous hairstyle is characterized by long hair being combed backwards throughout the head. That is your fringe hair, mid head hair and side head hair on both sides of the head. Thereafter, you should incorporate a blend of black and blonde look throughout your head. This is what makes the blonde Balayage hairstyle stand out from other similar hairstyles. That’s not all; the blonde Balayage hairstyle is characterized by curly-wavy look throughout the head. Finally, this top notch hairstyle can be used for both official and causal functions. As the name suggests, this hairstyle focuses on giving you a top notch chocolate color hairstyle. 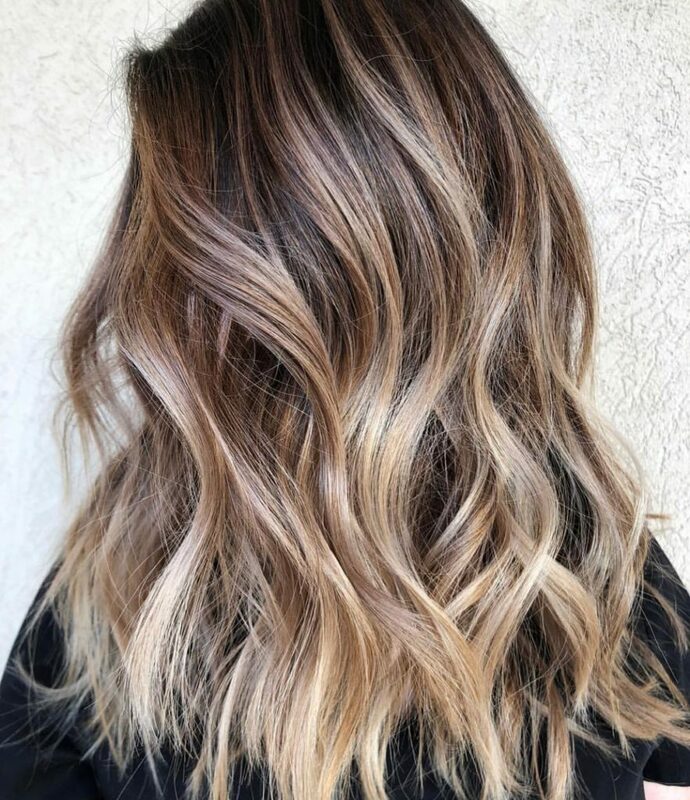 The chocolate highlight Balayage hairstyle perfectly suits woman who prefer their hair remaining within their neck region. It is characterized by your hair attaining a combination of black and chocolate color. Anyone can incorporate this hairstyle, despite the type of your hair. You are encouraged to blow dry your hair to give it a soft texture. Afterwards, your front view hair should be divided into two parts before attaining a curly look. Attaining a simple hairstyle can be boring at times, isn’t it? This is one reason you should consider the curly Balayage hairstyle. It is characterized by a line dividing your fringe hair and mid head hair into two parts. One part should be sleeked right and the other one left. Proceed and give your hair mixture of black and highlight color. Your front view hair should be combed towards the right and the left side of the head, whereas hair on the back should be combed straight. Afterwards, give your hair a curly-wavy look. This top notch hairstyle focuses on giving your hair a mixture of black, blonde and highlight color. Caramel & Ash hairstyle is characterized by giving combing all your hair towards the back. Before then, you are encouraged to comb all your front view hair either towards the right or the left side of the head and that on the back of the head straight. Go an extra mile and give your entire head hair a curly look. That’s not all; this marvelous hairstyle can be custom made into different designs. You need long hair to be eligible for this outstanding casual hairstyle. The brunette Balayage hairstyle focuses on giving you a diamond look on the back of your head. Your mid head hair, fringe hair and some section of your side head should be black in color. The rest of your hair should have a blend of black and highlight color. Comb all your head hair straight, apart from your fringe hair and mid head hair. Your fringe hair should be sleeked backwards and your mid head hair sideways. Go an extra mile and give your hair a curly-wavy look throughout the head. This is one of the simplest and easy to attain balayage hairstyles. Additionally, it can be incorporated by any type of hair. You are encouraged to blow dry your hair to enhance its texture. Go an extra mile and divide your front view hair into two parts. This is through a line that cuts across your fringe hair and mid head hair. That’s not all; you should incorporate blonde color on your black hair and give it a curly look up to its edges. It is definitely worth trying out. As the name suggests, this hairstyle focuses on giving your hair a layered look. It all starts by giving your hair a soft texture through blow dry. Top part of your hair should be black and the other part should attain the white color. This trend should be carried out throughout your head. Afterwards, all your head should be sleeked backwards before attaining the curly-wavy look. The layered balayage hairstyle is designed for casual events. However; it can be easily customized to suit official functions. Consider the white tendril hairstyle if you love unique hairstyles. As the name suggests, this top notch hairstyle is characterized by both black and white colors, throughout the head. Additionally, the white tendril hairstyle is characterized by curls emerging from your neck downwards. This top notch hairstyle suggests that all your hair should be combed backwards. White tendril hairstyle is a casual hairstyle that can be enhanced to suit official functions. You should definitely check it out. Weekend balayage hairstyle is suitable for women with long hair. Your stylist should start off by drawing a line from your hairline up to some point on your mid head. This line gives direction on which part of your front view hair should be sleeked right and which one should be combed towards the left side of the head. Your front view hair should be combed straight towards its respective direction before attaining curls. That’s not all; your hair should incorporate highlight color on your long black hair. This hairstyle is called camouflage as it incorporates numerous colors. Start off by dividing your front view hair into two parts. This is through a line that stretches from your hairline through your mid head. Each section should conjoin with your side head hair before being combed straight. That’s not all; your side head hair should attain curls up to its edges. These curls should incorporate highlight and white color. The camouflage balayage hairstyle gives you the opportunity to showcase your pretty face. Choose sleek back Balayage hairstyle if you are looking for an easy to maintain hairstyle. Simply start off by giving your hair a soft texture by blow drying it. Afterwards, divide your mid head and fringe hair into two parts. Each part should be sleeked backwards. This statement also applies to the hair on back of your head. That’s not all; you are encouraged to divide your hair into numerous layers. This feature makes this hairstyle stand out from other similar hairstyles. Consider the angel balayage hairstyle if you want to showcase your pretty face. Your left side head hair should be combed straight up to your shoulders. Alternatively, your mid head and fringe hair should be conjoined together with the right side head hair before being combed straight. Some section of your mid head and fringe hair should be sleeked towards the right side of your forehead. Above all, your entire head should attain a mixture of black and white color. Angel balayage hairstyle perfectly suits casual events. Plaiting can be stressful, especially if you are regularly change your hairstyle. Well, caramel hairstyle perfectly suits women who desire to give their hair some breathing space before plaiting it again. Caramel hairstyle is characterized by a mixture of black and highlight color. Additionally, this hairstyle insists that all your hair should be combed towards the back of the head and must attain the curly-wavy look. It is up to you to decide the length you desire your curls to reach. Finally, Caramel hairstyle is a causal hairstyle. Look no further if you are looking for an easy to attain hairstyle that is easily convertible to other hairstyles. As the name suggests, this hairstyle focuses on giving your hair a chocolate brown look. Additionally, traces of black color should be visible throughout your hair. It doesn’t stop there. All your head hair should be sleeked backwards. That is your mid head hair, fringe hair and side head hair on both sides of the head. Your entire head hair should attain curls as it stretches past your neck. 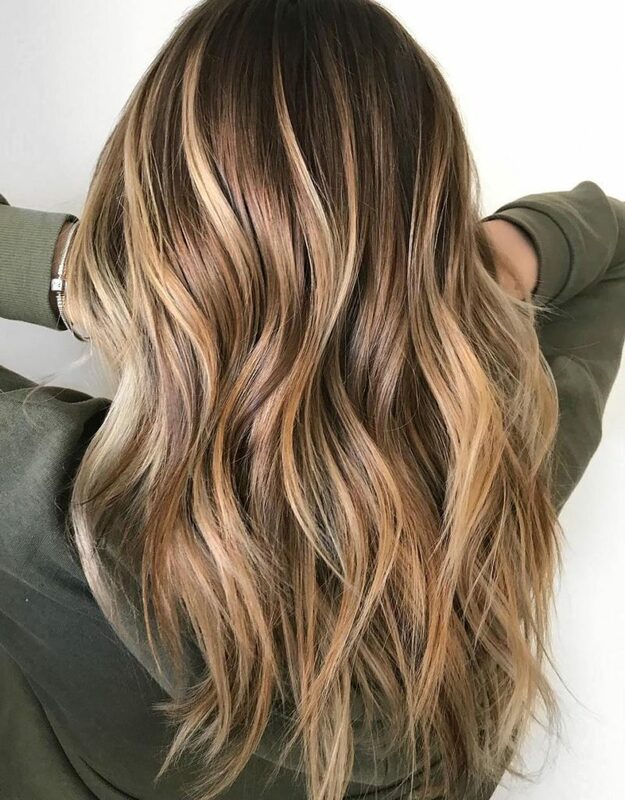 Blonde and white balayage hairstyle is characterized by your fringe hair and some section of your mid head hair being Blonde in color and the rest being white. It is characterized by your fringe hair and mid head hair being divided into two by a line. One part should conjoin with hair on the left side of the head and the rest towards the right side. Afterwards, all your hair should be sleeked towards the back of the head and should have curly look. New balayage hairstyles emerge regularly. The trendy balayage hairstyle is one of them. This hairstyle is unique in that a chocolate color should emerge on regions with curls. Trendy balayage hairstyle should be incorporated with long hair, despite their texture. Request your stylist to blow dry your hair to give it a soft texture. Afterwards, comb your fringe hair, mid head hair and hair on both sides of the head backwards. Above all, the trendy balayage hairstyle is characterized by a mixture of black and highlight color. This top notch hairstyle is characterized by your hair being combed backwards and should be trimmed to be even in terms of length. Consequently, the fall winter hairstyle is characterized by black color throughout the head. This top notch Balayage hairstyle can be used for both official and casual events. That’s not all; you are encouraged to apply special gel to divide your hair into numerous layers. All your hair; that is your fringe hair, mid head hair and your side head hair on both sides of the head should be directed towards the back. This marvelous hairstyle isn’t new to numerous women. Freestyle balayage hairstyle perfectly suits casual events. Your stylist should start off by drawing a line between your fringe hair and some section of your mid head hair. This line guides your stylist on the direction to comb a section of your front view hair. It can be towards the right or the left side of the head. All your front view hair should be combed straight towards their respective direction, after which they should attain curls. Neat & short hairstyle definitely deserves to be in the list of top balayage hairstyles worth checking out. It is characterized by most of your mid head hair being combed towards the right side of the head. The same statement applies to most of your fringe hair. Your fringe hair and mid head hair should conjoin with hair on the right side of the head and be combed straight. The rest of your front view hair should be sleeked behind the left ear. As the name suggests, this hairstyle brings focus towards your left shoulder. Start off by enhancing the texture of your hair through blow dry. Afterwards, comb your right sideways hair towards the back of your right ear. Afterwards, all your mid head hair and fringe hair should be conjoined with hair on the back of the head and that on the left sideways. Afterwards, it should be sleeked on top of the left shoulder after attaining the curly-wavy look. Start off by drawing a line between your mid head and fringe hair. This line is used to give direction on where particular hair section should face. Some section of your fringe hair should be combed straight. Your front view hair should conjoin with their respective hair before being combed straight. Additionally, your hair should be curly and should attain a mixture of black and highlight color. This top notch hairstyle definitely deserves to be in the list. The killer balayage hairstyle is a causal hairstyle but can be customized to suit official functions. There should be an almost invisible line that separates the left side head hair from the rest of the front view hair. Hair on the left side of the head should be sleeked behind the left ear whereas the rest of your hair should be combed towards the right side of the head. Check the killer balayage hairstyle out. Start off by sleeking your fringe hair past the left side of your forehead. Afterwards, most of your mid head hair should be combed towards the left side of the head. Your mid head hair should rest on top of your fringe hair before being combed straight. You should also comb straight hair on the left side of the head. The rest of the front view hair should also be sleeked straight. This hairstyle is characterized by a line that separates your front view hair into two parts. Hair on the right side of your head should be combed behind your right ear. Moving on, all the hair on the left side of the head should be combed straight, after which it should be given a curly look. Spice up the left tendril hairstyle with a mixture of blonde and highlight color. Consider this hairstyle if you want to look urban. Strategically start off by giving your hair a mixture of blonde and highlight color. Afterwards, your stylist should take your fringe hair and mid head and comb them towards the left side of the head. This should occur only after your hair has attained the curly-wavy look. The rest of your front view hair should be sleeked towards the back of the right ear. Uniform balayage hairstyle is characterized by your front view hair being systematically layered out. This occurs after your front view hair has been divided into two parts. Most part of your head should be black in color. However, traces of highlight color should be visible on some sections of your head. That’s not all; your side head hair should attain a curly-wavy look. All your mid head and fringe hair should be combed towards the right side of the head. These hair should conjoin with hair side head hair on the right side of the head and be combed straight. Hair on the left side of the front view should be sleeked behind your left ear. This is a pretty easy to attain hairstyle. It has been in existence since time in memorial. The old school balayage hairstyle is characterized by a mixture of black, highlight and blonde look. Your front view hair should be divided into two. One part should be combed straight towards the right and the other one towards the left. Divide your front view hair into two parts. The region around the mid head should be black, whereas the rest can attain the highlight color. You are encouraged to comb your hair straight before giving it the highlight color look. Above all, your hair should remain within the neck region. Finally, we have the Gisele Balayage hairstyle. This hairstyle advocates for your fringe hair being divided into two parts. One part should be combed straight towards the right and the other part towards the left side. Hair on the right side of the head should incorporate curly-wavy look. Make an effort of checking out this top notch hairstyle.